that is good but did you do a paint the number kit? my friend had a paint the number kit and it looked exactly like that every detail and all i am not kidding and would not lie about something like that. Nice job! wish i could do something like that but i am the worst at drawing horses even though I absolutely LOVE them! Wow! That is amazing but i know a paint by numbers when i see it. I have the exact same one. did you seriously DRAW that?! i love it! my favorite animal is a horse and i need to learn how to draw them again, wow! You did a great job. I have one sort of like that but I never finished it. Takes a ton of patience! 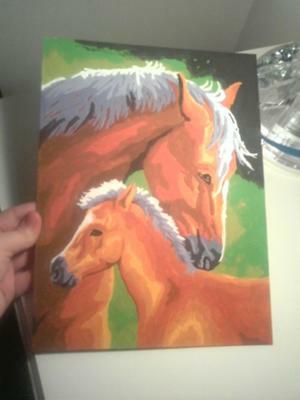 Paint by Numbers is an excellent way to get familiar with paint as well as horse conformation! I did quite a few when I was your age! They are a great training tool for the inspiring horse artist! You should try another one...this turned out so well! great job! i got that same one from wal-mart.it me alot of patience to do it. i'm 11 years old, and i live in oklahoma. i used to live in texas. i love horses, and my friends and family say im really good at drawing horses. i can do other animals but not as good. i will post some of my pics up here!!! Holy Cow! Great Job girl! It looks real! That is really good! I could never paint that well! that looks like you did a Paint by Number kit, but it still looks cool.